Kingdom’s Reign spans the time from the second coming of Christ to the end of the ages. 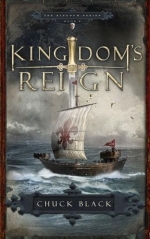 Kingdom’s Reign is the sixth book in the series and spans the time from the second coming of Christ to the end of the ages. The central characters are Cedric and Talea, a mysterious woman from across the Great Sea. Cedric joins the Prince in the great battle to retake the kingdom from the evil Dark Knight and his Shadow Warriors. A kingdom of peace is the ultimate goal, but how long will it truly last? The Dark Knight and his massive evil army are descending on the one city that stands in his way from controlling the entire kingdom …Chessington. Cedric now rides with the Prince once again to defend the people of this beloved city from the destruction of the Dark Knight. It is the battle of the ages. The outcome will determine who will rule the Kingdom of Arrethtrae! This book is the final novel in the Kingdom Series, an allegory of the entire Bible where castles, swords, and battles are all Biblically symbolic. From the pages of Revelation, the saga of Cedric of Chessington, a pauper turned knight, reaches a dramatic conclusion. He is given a mission that takes him across the Great Sea back to the Kingdom of Arrethtrae. From battles with Shadow Warriors, to encounters with the deadly creatures of the Isle of Sedah, Cedric’s courage and faith are tested. The beautiful but mysterious Talea, his mission assistant, proves to be invaluable when they encounter the steel of the Dark Knights evil warriors. Just when victory is within their grasp, the Dark Knight unveils his ultimate plan to kill the Prince and to rule the land once and for all. Will Cedric and Talea survive to warn the Prince? Two kings but only one kingdom…who will reign depends on them!